For my blog followers, you may know that I have been missing the formal weekly Wednesday wine tastings in Sandwich. Good news is they are starting up again in a few weeks. Since we are still in town and still having guests, I need new wines now to serve at our bed and breakfast. I am taking advantage of less formal tasting opportunities and creating some of my own by revisiting wines I have liked it the past. A wine loving friend gave me a Papapietro Perry 2000 Peters Vineyard Sonoma Coast Pinot Noir for Christmas. My good friends know I love Papapietro Perry, which I discovered on our great 2006 wine odyssey when we put 13,000 miles on our then new Winnebago Aspect. We went across country on US I 10 and stopped when we hit the Pacific Ocean in Santa Barbara, CA. We worked our way north on Highway 1, also known as Pacific Coast Highway, and ended up in Healdsburg in the heart of the Sonoma Valley. An old high school friend from forty years ago introduced me to Bruce Perry at his tasting room in newly renovated buildings that originally was a sun-dried tomato process farm. My friend knew Bruce and his winemaking friend Ben Papapietro in San Francisco, where they used to drink home made wine from Ben’s garage. They have come a long way from that garage. That day we also met Ben and barrel tasted the just harvested 2005 vintage. I fell in love with their Pinot Noirs. 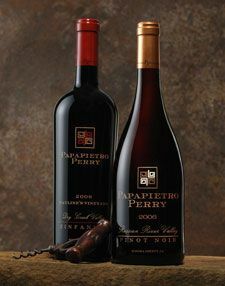 It was not surprising that I had not heard of Papapietro Perry since at that time they were not widely distributed outside of Sonoma. Even before we made it home, awareness of this wine was raised when the next issue of the Wine Spectator reviewed all the wines I had tasted giving them all 90+-point ratings. The next year, The Pinot Report named Ben Papapietro the #1 Master Vintner of 2006. Their success continues with most of their 2008 releases still scoring in the 90+ ranges. Not only did I think the wine was great, but so do a lot of the industry experts. I joined their wine club and now look forward to my semi-annual shipment that I hoard for special occasions. I enjoyed the 2000 with friends, sort of an informal tasting, and if you visit us at our Sandwich Inn, I just may be serving one of my cellared Papapietro Perry wines.